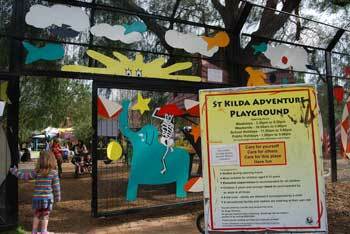 I found my new favourite place this weekend - the St Kilda Adventure Playground. It’s wonderful – make sure you pay it a visit. ..........remember to tell me any great places YOU know about which I haven’t mentioned on the website yet so that others can benefit too. 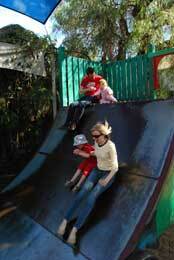 .........There are also tables and chairs set up in a sheltered area to have your picnics. You’ll find staff on site at all times too which is great as it keeps the playground free from any vandalism and other problems. 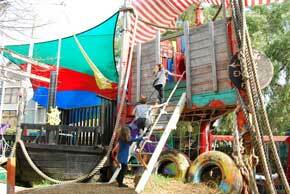 .........There’s also a treehouse for the older kids to play in and some type of airplane. I’ll probably be able to tell you about a few more things next week as I’m under strict orders to go back again next weekend! Another good thing about the playground is that there’s a lot of shelter from the sun which is something I’ve found to be pretty rare here in Australia. .........I wish there were more playgrounds like this one. ........Normal opening times are 3.30pm – 5.30pm Mon – Fri and 11am – 5pm Sat and Sundays but it does close sometimes and apparently it’s best to call 9209 6348 before you go to make sure it’s open. It’s always closed between 24th December and 4th January too. You can also arrange birthday parties here but this is subject to a charge. 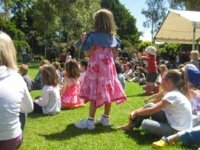 Although the council say the playground has been designed for kids between the ages of 5 and 12, there seems to be plenty of things younger kids can have a go on. You'll find free two hour parking spots available in nearby streets.